Directly on the famous Esplanade at Woolacombe, the Little Beach development is in a wonderful position not only opposite the main 3 mile beach but also virtually across the road from the unique little shell beach of Barricane from which Little beach takes it’s name. 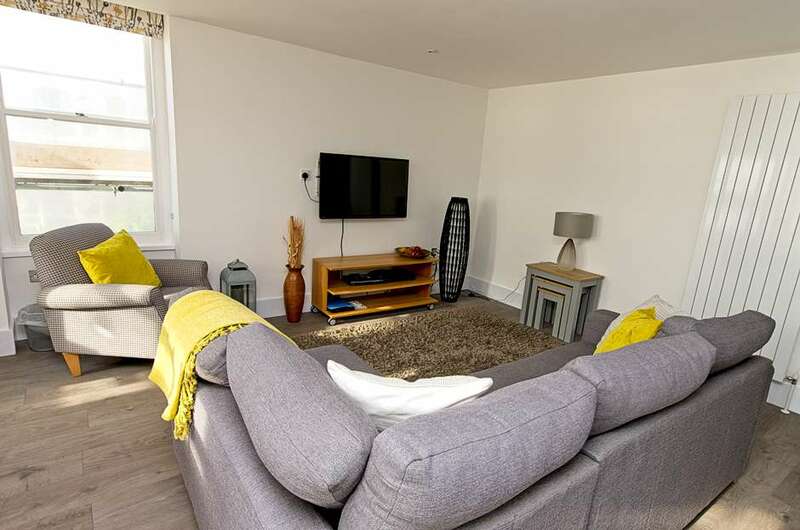 Number 5 Little Beach is a lovely 2 bedroom apartment on the front offering the most spectacular views from the open plan living/dining room, kitchen and not to mention, the large first floor balcony. Parking and access are at the rear of the building and down a flight of internal stairs. As you enter the main living/dining room, the first thing that strikes you is the breathtaking view and the light as the room commands a great first floor position in the development. With wooden floors running throughout, this large is open plan and the huge bay sash windows offer a panoramic view over the bay and across to Lundy Island. This leads to the balcony with table and chairs for 4 to enjoy meals or a drink overlooking the bay. There is a grey fabric corner sofa/sofa bed (suitable for occasional use), dining table for 6, TV/DVD, stereo, and Wi-Fi. Off the modern white kitchen is a useful pantry cupboard and the integrated kitchen units house full size fridge/freezer, dish washer, washer/dryer, oven hob and microwave. There is a cloaks/WC off the living room. The master bedroom has a king-size bed and full large en-suite facilities with shower over bath, WC and sink. Even the twin room has a shower en-suite with WC and sink. This room has 2 x 2’6” single beds, clothes storage. A £100 security deposit is held and released after the holiday. A truly wonderful apartment ticking all the boxes for a beach side holiday. A truly wonderful apartment ticking all the boxes for a beach side holiday.